High Point's natural drainage system is one of the largest in the country. The system beautifies streetscapes and parks while naturally managing stormwater, improving water quality for residents, and protecting valuable environmental assets— including the endangered salmon run downstream in nearby Longfellow Creek. Endangered species can be protected from contaminants through stormwater management, and High Point’s innovative natural drainage system protects salmon habitat. Longfellow Creek is a three-mile, year-round urban creek in West Seattle's Delridge neighborhood, and High Point is located within a sub-basin of Longfellow Creek watershed. Because this watershed is Seattle's most productive salmon-spawning stream—and one of the last four remaining salmon runs in the city—planners went to great lengths to ensure the neighborhood would have the least amount of impact on it. The Seattle Housing Authority and city of Seattle thus partnered to integrate a natural stormwater drainage system into the redevelopment project. This system treats stormwater runoff in an ecologically sensitive way, and enhances the quality of water draining to Longfellow Creek. Since 8% of the stormwater that ends up in Longfellow Creek falls on the ground at High Point, the neighborhood is a crucial part of the comprehensive community effort to restore this creek as a vital fish habitat. Improving the water quality of Longfellow Creek became a deep point of connection between the new community and the rest of West Seattle. The city provided funding to cover the costs of this unique system, which incorporates bioretention swales, native plantings, permeable pavers, rain gardens, and a retention pond. Prior to redevelopment, gutters and big drainage pipe shunted stormwater (including spilled oil, pesticides, and other pollutants) from streets directly to the creek. 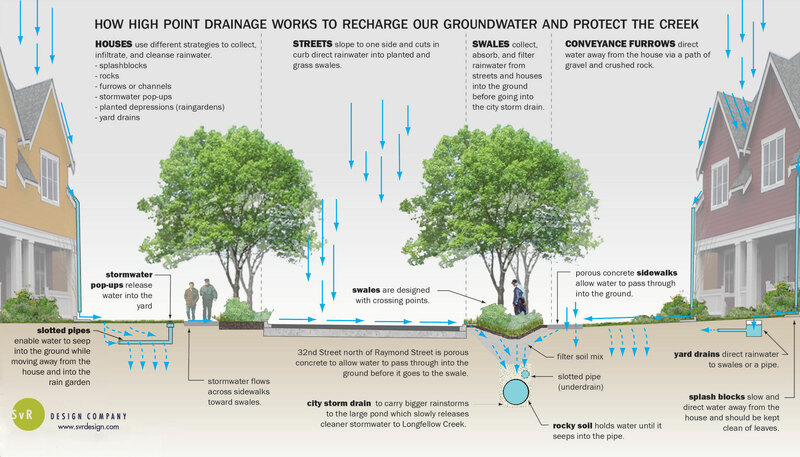 Now, stormwater flows through bioswales, yard drains, storm drains, rain gardens, and porous streets and walkways into underground slotted pipes. From there, the water travels into a stormwater pond, and eventually into Longfellow Creek. Then, the filtered stormwater flows from Longfellow Creek into Puget Sound. Stormwater run-off is the largest source of pollution in Puget Sound and High Point’s natural drainage system reduces the amount of polluted stormwater run off that travels into Puget Sound. Read on for further details about each of this innovative system's key features. One of the drainage system's most important elements is four miles of a network of vegetated and grass-lined swales, combined with amended soil that helps handle excess rainfall. The swales replace conventional street curbs and gutters with vegetated drainage channels designed to collect, channel, and filter stormwater. At the same time, the swales beautify the neighborhood and provide additional play areas. The swales line one side of each street. Streets tilt slightly toward the swales, helping to direct water flows into the absorbent vegetation. The swales are planted with native and drought-tolerant grass, trees, and shrubs, and layered with compost (much like the floor of a forest). This naturally filters toxins from rainwater. The swales are made possible by reducing the paved area. Less pavement also reduces the amount of polluting toxins that enter the system via runoff. Narrower streets not only reduce runoff, but help create a friendly, intimate neighborhood feel. High Point's landscaping is also maintained using organic landscaping methods, so that water quality is further protected and improved and water that does flow into the creek is cleaner. Another integral feature of the natural stormwater management system is a stormwater retention pond. In addition to providing a scenic view and a local gathering place, the pond plays a crucial role in absorbing and filtering stormwater before finally channeling it into Longfellow Creek. A quarter-mile walking trail and gathering space was constructed around the 22-acre-foot retention pond. The surrounding beautiful three-acre pond park at the north end of High Point features benches along the walking paths, natural grass, specially commissioned art, and a waterfall stream that recirculates water from the pond. Well-situated rain gardens using the proper foliage, soil, sloping, and overflow provide another attractive and cost-effective way to contain and infiltrate stormwater. A rain garden is a shallow depression planted with perennials shrubs, small trees or herbaceous plants that can withstand periodic inundations of water. In addition to the swales specifically, all landscaping at High Point was carefully selected and designed for maximum absorption and filtering, using a rain garden design wherever possible. Adding to the absorption rate of rainfall, most of the streets and sidewalks at High Point are made of porous, rice-cake-textured concrete. High Point was the first community in the state to feature permeable pavements in residential streets, sidewalks, parking lots, sidewalks, and basketball courts. "Impervious" surfaces are mainly artificial structures—such as rooftops or pavements (roads, sidewalks, driveways and parking lots) that are covered by impenetrable materials such as asphalt, concrete, brick, stone. Soils compacted by urban development are also highly impervious. Impervious surfaces reduce infiltration of water into the ground and accelerate runoff to ditches and streams. On a site that was formerly 65 percent impervious, High Point's natural drainage system now infiltrates 75 to 80 percent of stormwater runoff. Stormwater flowing into Longfellow Creek is reduced roughly 65 percent. High Point has proven that street grids can manage stormwater runoff while creating a safer pedestrian environment.